The State of California began acquiring land for the Santa Susana State Historic Park in 1979. Located north of Chatsworth Park and south of Rocky Peak, the park has grown from subsequent land purchases to its present size of 670 acres. In 2007, CORBA representatives attended planning meetings, and provided input on the trails to the project manager. Thanks to this input, most of the trails in the general plan will be designated as multi-use trails. The trail of most concern was the Devil’s Slide area of the Old Santa Susana Stagecoach Road. This is a very steep and rocky section of trail. It is hard to imagine that stagecoaches traveled down this trail, but they did! This trail provides access to the park from the north side to the south side of the park and vice versa. If this trail had not been deemed multi-use, mountain bikers would have only had access from the southern trailhead at Valley Circle and Lassen Street. This would have made it impossible to loop the Park’s trails with the Rocky Peak area trails without significant paved road riding. Very few trails will be restricted to hikers only. Those that are, will be interpretive trails with informational signs describing the native people, plants and animals that inhabit or did inhabit the area in the past. The most controversial part of the plan for local residents pertains to a proposed campground. The locals are concerned about fires being accidentally started by careless campers, and about the potential that the campground would attract “undesirable types of people.” The proposed campground would be located on the old Spahn Ranch site. On Febuary 29th, 2008, CORBA and IMBA representatives were present when the State of California Recreation and Parks Commission approved the Preliminary General Plan! Mark Your Calendars: SUNDAY, OCTOBER 12, 2008! Last year’s Fat Tire Fest had the biggest turn out ever with over 500 participants. This year’s event will be at a new location, Castaic Lake Recreation Area, in Castaic, CA, a 30-minute drive from the Sherman Oaks area of the San Fernando Valley. We are planning new events such as a kid’s mountain bike rodeo. Once again, Cynergy will sponsor a Hill Climb contest and provide prizes for the best times. Bike Warrior will be hosting the wheelie contest. 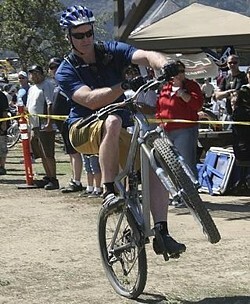 Last year’s lucky wheelie contest winner won a Scott mountain bike. Giant and Specialized are set to join us and will be bringing great prizes for the giant raffle, as well as lots of demo bikes to try out on the trails. ERGON USA will be a new exhibitor this year, bringing their line of grips and bike gear. Join us in celebrating this fantastic sport while supporting CORBA’s community- based programs and advocacy efforts that keep the trails open for you to ride. Come out for the fun, win bikes and other prizes, hone your skills or learn new ones at the MTB pro clinic, enjoy great food, and cross-country rides! Your contribution and participation provides vital support for CORBA’s goals. The Northern California High School Mountain Bike Racing League (NorCal League) is pleased and excited to be launching a new League – The Southern California Interscholastic Cycling League (SoCal League). This new league will be created with the same goal that has proven so successful in Northern California, which is helping participants achieve personal growth. 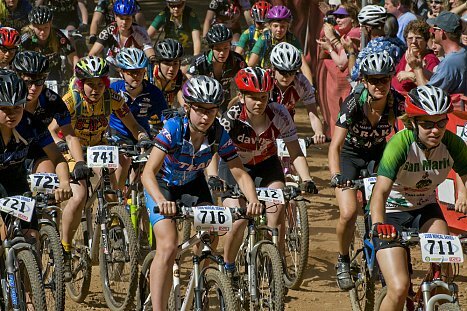 Over the past eight years, the NorCal League has developed methods and curriculum for introducing young riders to the world of mountain bike racing. We have successfully recruited and trained coaches who are committed to producing amateur athletes who are gracious in both victory and defeat, and respectful to their communities. We believe that good coaching means working closely with families, as well as helping athletes to create a balanced life perspective. NorCal high school mountain bike teams have become no less important to the social fabric in our high schools than other sports like baseball, football and soccer. We invite all cyclists to get involved as coaches, volunteers, or supporters. After a warm welcome by our host, Kozo Shimano, at the Shimano headquarters in Irvine, the IMBA Southern California Summit focused on the issues that are critical to mountain bikers. The primary purpose of the June 7 summit was to coalesce the regional advocacy groups and share the common concerns that effect us all. Tom Ward, IMBA’s California representative in Sacramento, moderated and led the discussion with assistance from our local IMBA representative, Jim Hasenauer. CORBA was represented by board member Louisa Bonnie. The discussions included the Boxer wilderness bill and preserving critical trails within targeted wilderness areas, gathering local knowledge and information about these trails, State Parks development of consistent procedures for changing trail designation, relations with the equestrian community, creation of ride centers and bike parks, and the building of illegal trails. The summit reinforced the importance of staying connected, sharing information and improving communication between the advocacy groups thereby strengthening our ability to reach our goals. 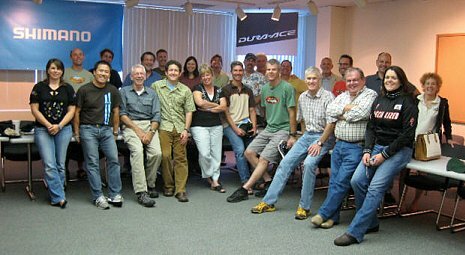 Other mountain bike advocacy groups in attendance included SHARE, Trails For All, Warrior Society, Central California Off-Road Cyclists, Go Bike, San Diego Mountain Bike Club, and Santa Barbara Mountain Bike Trail Volunteers. Representatives from Specialized, REI and Crank Brothers were seated at the conference next to Forest Service personnel, the Orange County Trails Commissioner, and State Parks Trail engineer Carl Knapp. Additional IMBA representatives attending were Daniel Greenstadt from San Diego and Rich Cook from Boulder, CO.
CORBA is arranging a meeting of the advocacy groups in the Spring of 2009. For more information on the spring meeting, contact Louisa Bonnie: mtbike4@verizon.net. 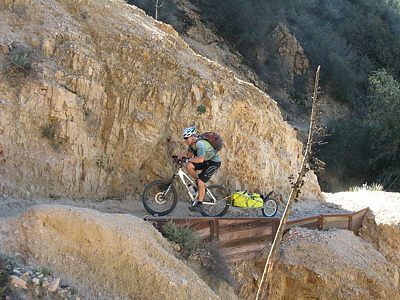 Local IMBA representative Jim Hasenauer can be contacted at: imbajim@ aol.com and IMBA California representative Tom Ward can be reached at: tom@imba.com. Summer is nearly over, but the hot months of September and October are just around the corner and temperatures have already passed 100 degrees several times. Here are some tips to help you safely enjoy riding in the summer and warm fall months. Try to avoid riding in the hottest hours of the day by riding early in the morning or evening. Bring plenty of water and hydrate often and early. Even if you don’t plan on doing a long ride, fill your hydration pack’s reservoir. Don’t wait to start drinking during your ride. At a minimum, start in the morning or the night before a ride on a hot day. Protect yourself with light colored, breathable clothing. Be kind to your eyes by wearing sunglasses with UV protection. Conserve energy by taking breaks in the shade. Plan rides based on sun exposure. Ride east-facing slopes in the afternoon, and west-facing slopes in the morning. Choose forest trails over desert trails. Hydration is even more important at higher elevations. The higher the altitude, the lower the temperature. Know the signs of heat exhaustion and heat stroke and what to do about them. What are the symptoms of heat exhaustion? Headaches are usually the first sign of dehydration. Light-headedness or dizziness are the last. Drinking plenty of water is critical. Other symptoms can include weakness, mood changes such as irritability, confusion, or the inability to think straight, upset stomach, vomiting, decreased or dark colored urine, fainting or passing out, and pale, clammy skin. What should you do if you or another has heat exhaustion? Act immediately. If not treated, heat exhaustion may advance to heat stroke or death. Move the victim to a cool, shaded area to rest. Don’t leave the person alone. If symptoms include dizziness or lightheadedness, lay the victim on his or her back and raise the legs six to eight inches. If symptoms include nausea or upset stomach, lay the victim on his or her side. Loosen and remove any heavy clothing. Have the person drink cool water (about a cup every 15 minutes) unless sick to the stomach. Cool the person’s body by fanning and spraying with a cool mist of water or applying a wet cloth to the person’s skin. Call 911 for emergency help if the person does not feel better in a few minutes. I have been riding mountain bikes since 1983 and have been involved in advocacy since 1987, so a lot of these rules of the trail are second nature to me. As I started to write down my thoughts, I realized that many things have changed since the CORBA Rules Of The Trail were first penned (which just happen to be IMBA’s rules boiled down to the bare essentials – mostly from input from our own Jim Hasenauer). Following are the things that I tell people when asked if I have any suggestions on proper backcountry etiquette while on a mountain bike. These are not in any particular order of importance. Slow down a little, especially in a park where there are lots of other people. Lots of cars in the parking lot equal lots of people! Treat others as you would like to be treated. Imagine if you were the one hiking or riding a horse. Scan as far ahead on the trail as possible for other trail users. Always assume there’s someone around the next corner, perhaps a small child that can’t jump out of your way. Announce yourself well in advance when approaching others from behind. 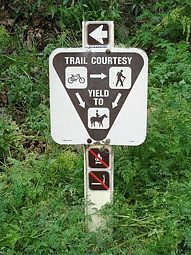 Never assume that a hiker or equestrian hears you approaching (don’t yell “on your left” just as you’re about to pass; this is not a race course or bike path). A handlebar bell or bell tied to your saddle works well, but a cordial greeting can have the most positive effect. If a hiker or equestrian does not respond, for any number of reasons (listening to music with earphones, etc. ), slow down and use care and discretion in this situation, and pass slowly. As for earphones, it is illegal to have buds in both ears at the same time when riding; one must be out. If you come upon a group of hikers that won’t move out of your way, get off your bike and walk into the group, asking nicely if you can “play through". Hikers seem to get the golf reference. Always ask a horseback rider if it’s okay to pass. Do not assume it is okay just because you’ve told them you’re coming. Sometimes a rider needs to move off the trail and even turn the horse to face you so it isn’t scared. When letting an equestrian pass, stand on the low side of the trail. And always talk to the rider, whether they are passing you or they are passing you. Don’t skid unless absolutely necessary, which for the most part is never. Never cut a switchback or ride off of a trail. Doing so causes erosion and damages the trail. Don’t build unauthorized jumps, stunts or bonus runs. Know in advance where you’re going to be riding, and let someone else know too. Pack out more than you pack in. Be respectful to the neighborhoods where you park. Turn down your stereo before getting out of your vehicle. Avoid riding abreast on fire roads and double track as it makes it more difficult for oncoming riders to pass, especially if they’re going a bit too fast. And in National Park Service properties it’s actually illegal. Always carry two spare tubes; one for you, and one for the person who isn’t carrying one (and for those really bad thorn days). Patch kits are also okay, but once you open the tube of glue it’s basically worthless – often the glue dries up within a couple of days, even with the cap on. Be self-sufficient: Carry enough of whatever you’ll need for the entire ride. ALWAYS carry more water than you think you’ll need. Carry emergency contact and medical info, as well as your cell phone. Be sure to program an emergency contact number into your phone and “ICE”, or “In Case of Emergency.” Consider purchasing the Road I.D. which has emergency information on it. We’re all familiar with the “yield protocol,” right? 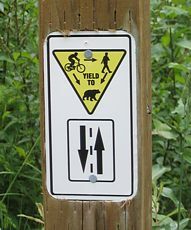 Hikers yield to equestrians, cyclists yield to hikers and equestrians. 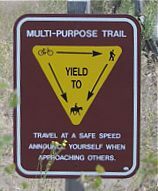 However, there is no rule pertaining to who yields to whom when you’re on a bike and encounter someone going uphill or downhill. I’ve stopped for riders in each direction, depending on who it was easier and/or safer for to stop. If you can pass each other safely without stopping, go for it. But remember, when you’re on a singletrack, look at the trail, not the rider, or you’re likely to run into the rider. Also you should always stay to your right when passing other users coming towards you. “Yield means SLOWDOWN, be prepared to stop, establish communication and then pass safely. So actually, both riders yield and should be prepared to stop, and then they work out the pass. It’s similar to cars merging on the freeway. The oncoming car has to find the safe space to move into, but a car already on the freeway is likely to move over and make room. There’s no set rule who must yield uphill or downhill, but it’s been generally accepted that the rider moving downhill yields, because it’s easier for them to get started again. No one should assume that another is going to stop, dismount, et cetera. It’s all about the communication.” Bottom line: When in doubt, yield the right-of-way. As new residences in Dos Vientos division of Thousand Oaks sprang up several years ago, so too did a new open space, which was followed by new trails. There are now over 17 miles of multi-use trails, of which almost 60% is single-track. 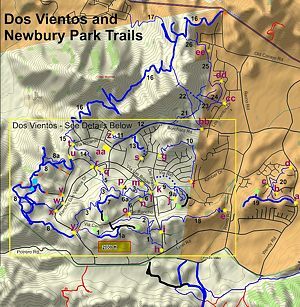 This includes the Reino Trail that connects to Newbury Park, and was constructed in large part by CORBA and IMBA. There are about two dozen access points and connections to neighboring Newbury Park, Rancho Sierra Vista/Satwiwa and Pt. Mugu State Park (aka Sycamore Canyon), and even Camarillo via Conejo Mountain Edison Road. With so much access, there are plenty of opportunities to try out these trails. The singletrack is built to modern multiuse standards. Typically the trail will climb a ridge from street level, follow a contour for some distance with a great view into the valley below, and then descend back to the street. Housing construction continues, and when completed, more trails will be accessible, though some access points may change. 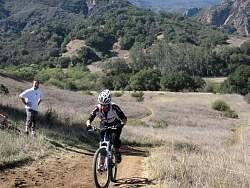 The Conejo Open Space Conservation Agency manages Dos Vientos and many other recreational open spaces in Thousand Oaks. For more information go to www.cosf.org. OTB began in 1993. Regular weeknight rides are at 6:00 pm every Tuesday and Thursday all year. The weeknight rides are usually open to all levels of riders. The club also rides on most Saturdays with occasional Sunday rides as well. The weekend rides are usually for intermediate – advanced riders. Locations vary and often include rides in the Verdugo Hills, San Gabriel Mountains, Santa Monica Mountains and the Santa Susanna Mountains. 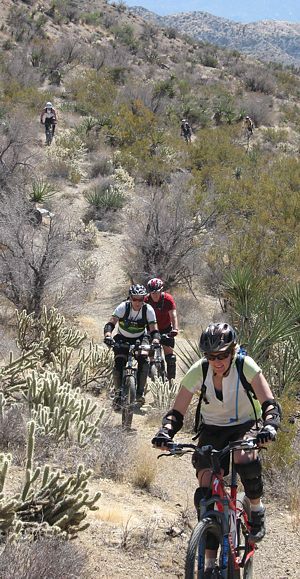 OTB has several MTB trips throughout the year. Past trips have included Mammoth Lakes, Santa Cruz, Arizona, and Utah. There is also an annual road bike tour each year. These road tours have included trips through California’s National Parks, along the California Coast, Baja California, and Cuba. OTB members are also very active participants on CORBA Trail Crew trail maintenance days. There are many ways to enjoy a trail. Most CORBA members list mountain biking as their favorite, though many also enjoy hiking or backpacking. For a true nature experience on a mountain bike, nothing comes close to bike-packing, which combines the mountain bike’s ability to cover more distance with the solitude and adventure of an overnight backpacking trip. 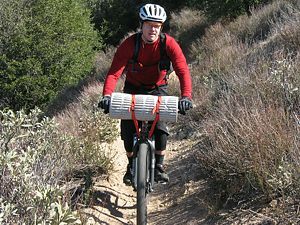 There are a number of ways to carry overnight gear on a mountain bike. Bob trailers work really well, but can be heavy for long climbs. Backpacks work too, but make bike-handing on technical trails more difficult. A combination of a small backpack and frame packs or racks and panniers also works well, and probably allow for the most efficient travel. Pack Smart When bike-packing, weight is a big factor. It’s amazing how little we must have to survive in the outdoors: water, food and shelter. Water is one of the heaviest things to carry, but is our most vital human need. Think about water sources when planning your route, and the need for purifying water. For food, dehydrated camp foods and calorie-dense snack foods give the best calorie to weight ratio. Do you really need a tent, or can you get by with a bevy sack or just a sleeping bag? Multi-purpose items save weight as well; a rain-poncho that doubles as a tent, or the pot in which you cook can double as your serving bowl. When packing, keep asking yourself, “Do I really need this? Is there a lighter option that will get the job done? Will wearing the same shorts two days really hurt me?” Think light, not luxury. Plan Your Route To get started, choose an area with which you’re familiar. Check the weather, water sources, and plan your route. How many of the trails you regularly ride have campgrounds along the way? There are many in the Angeles National Forest and other areas. Even if it’s a short ride in, stop frequently and enjoy your location. It’s amazing how much you notice when you stop and look around. That’s one area where the ability to cover more ground has its drawbacks. We sometimes forget to really take in the beauty of our surroundings. Spending two nights at the same camp, and doing a day-ride from the campsite without your overnight gear is a great way to put together an easy three-day trip. With the rising cost of fuel, camping fees, and concern for the environment, bike-packing is a rewarding way to spend a few days communing with nature, on a mountain bike. As reported in past issues of the Terra Times, the City of Glendale was very receptive to receiving input from CORBA for their Master Trails Plan. In fact, CORBA volunteers did much of the work that ended up in the plan, which was approved by the Glendale City Council this past January. We were very happy with the result. The Master Plan includes trail corridors that we suggested would enhance the existing fire road network with a number of new single track trails in key areas. It also includes a provision for a Mountain Bike Skills Park in the San Rafael Hills. We recently completed our first ever trail work days on Glendale City lands. In June, our first project was on the short single track trail at the bottom of Las Flores Motorway, which is located above Sunshine Drive. In July, CORBA also conducted an introduction to trail maintenance class and field session for Glendale City volunteers at Deukmejian Wilderness Park on the Rim of the Valley Trail. We’re excited to continue working with the City to start implementing their new Trails Master Plan sooner, rather than later. The Bike Park is a big draw, and has the potential to be an incredible resource to the greater Los Angeles area; especially for the youth and residents of Glendale. Three sites are under consideration. The first site will most likely be used for expansion of the soccer fields. We’re waiting on final word on the second site, known as “Site C”. There is also a third site with good potential as well. Once a site is identified and the proper studies are complete, we can begin surveying the site and making recommendations. CORBA expects to continue to play a significant role and keep this process moving forward, and to support Glendale in their efforts. The City of Glendale has already expressed their gratitude for our support, and have proven to be very accommodating to the needs of mountain bikers. Since becoming the CORBA Trail Crew leader three years ago, I have heard many different opinions pertaining to “optimal” trail conditions. Some riders tell me they prefer the trails as smooth as the bike path at the beach. Highly skilled riders are seeking more technical trails. I have even heard from some riders that think we should leave the trails as they are and let nature take its course. One thing is certain; there is a need for all types of trails to accommodate the different skill levels of riders. When we plan for a trail’s maintenance, one of the most important considerations is determining if the trail is sustainable. Water-induced erosion is a trail’s worst enemy. We need to consider what a trail could look like in several years if the current rate of erosion continues. Rain induced ruts can add technical challenges. However, if the trail eventually erodes or slides away, it is much harder to rebuild it then it would have been to prevent the erosion from happening in the first place. So we must add water diversions to the trails to prevent erosion. The best method of water diversion is the rolling grade dip. When done properly, you will not even notice it is there. It is also important to maintain an out slope to the trail tread so that water will sheet off the trail instead of running down its center. There are better ways to add challenges to trails then letting them erode. Leaving or adding rocks and logs on the trail can add challenges far better than erosion ruts. They will also slow riders down. Riders will be traveling at slower speeds yet have the sensation of speed due to more technical challenges. And the trail will be both sustainable and easier to maintain. Another important factor when maintaining trails is creating clear sightlines. The benefit is enhanced safety for everyone as riders and other trail users can clearly see the trail, obstacles, and other trail users ahead. Without periodic brushwork, vegetation will take back the trails. This past Spring proved to be a year of significant plant growth, as you may have noticed on local single-track trails. Please come out and help the CORBA Trail Crew maintain the trails that give you so much pleasure and good health. Our schedule is available on the CORBA web site under "Trail Activities." The message changes every day at 2 p.m. It is illegal to ride in the parks when they are closed due to high fire danger. 1. 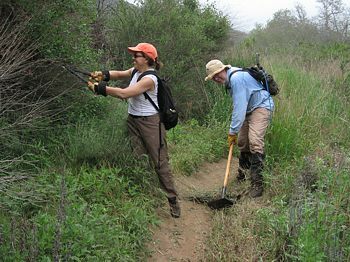 Maintaining access to and gaining access to trails in Los Angeles and its surrounding areas, through education, information and preservation. 2. 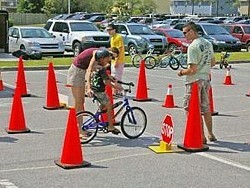 Educating mountain bicyclists in the safe and appropriate use of mountain bikes. 3. Contributing to the building and maintaining of riding areas in Los Angeles and its surrounding areas.